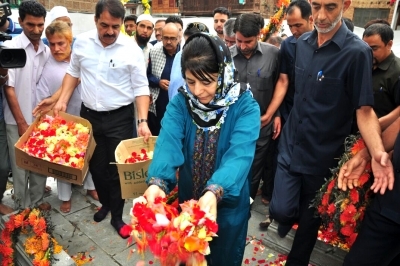 New Delhi July 13 (IANS) Former Jammu and Kashmir Chief Minister Mehbooba Mufti has exposed her proximity with separatists by warning that if her Peoples Democratic Party (PDP) was split it would create more militants in the state. Union Minister of Minority Affairs Mukhtar Abbas Naqvi said Mufti with her statement was "trying to give oxygen to terrorists". "Knowing or unknowingly she has only exposed her proximity to separatists " the BJP leadear said. At a press conference in Srinagar the PDP chief said if the central government split her party to form new government in the state it would create more Salahuddins and Yasin Maliks -- who were first to take arms after the 1987 elections were allegedly rigged. Reacting to Mufti s statement BJP s central committee member G.V.L. Narasimha Rao said Mufti s remarks were "very bizzare". Mufti he said "seems under tremendous pressure from her own party. "Is she now equating her party with Hizbul Mujahiddin " he asked. Former Jammu and Kashmir Deputy Chief Minister and senior state BJP leader Kavinder Gupta said: "It is very unfortuantae that she (Mufti) was ruling the state only a few days back as Chief Minister and now she threatens of a terror uprising."